Visit the only original intact windmill factory museum in the USA. Step inside the modest, one-story structure on Central Avenue in Nebraska City and you will enter a world that few have experienced; the manufacture of windmills as tools of modern technology circa 1902. As you enter you can almost sense the heat of the forge, feel the rumbling from vibrations of the huge overhead machines and hear hammer meeting metal in the fabrication area. 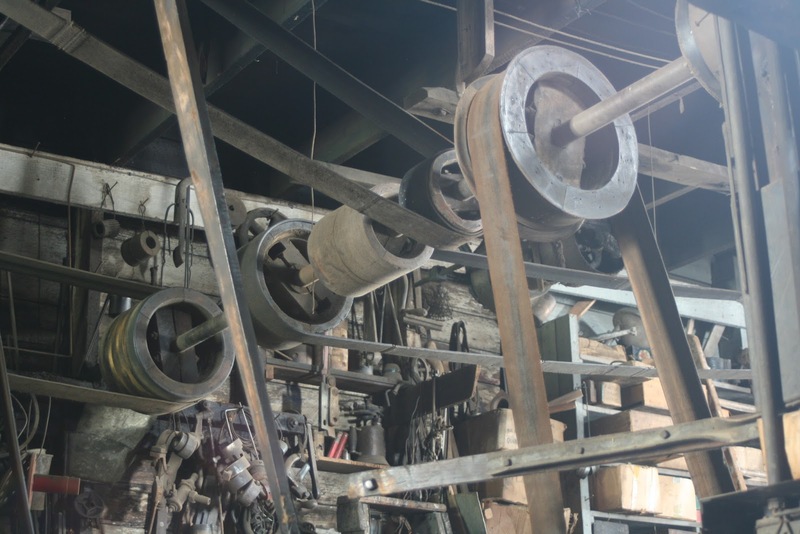 The museum has been described as a time capsule of early 20th Century shop-type manufacturing. Everyday things such as ledger books on shelves, telephone, pencils and pens on the desk, even an overcoat on a hook remain where they were last used. The building appears much as it did in the 1930’s when invoices were written by hand, correspondence was typed on a manual typewriter machine and even local phone calls were be placed through an operator. David Flatt has been the Executive Director of the Kregel Windmill Factory Museum since 2016. Previously he taught historical archaeology directing field schools and archaeology projects for Southern Illinois University, University of Illinois, McKendree University, Assumption College, and Leiden University. He was also an administrator at AIMS college in Colorado as well as Assistant Director of Huntington Learning Center in Greeley, Colorado. David has done archaeology field work in the USA, Europe, and Asia. He has a Masters in history from St. Louis University as well as two Bachelors in history and anthropology from Southern Illinois University. Currently, he is working on his PhD in anthropology with Flinders University in Australia. David was the president of the Lamda Alpha honor society, an officer in the anthropology club, and awarded the top anthropology student and top anthropology field school student while attending SIUE. Prior to his work as an historical archaeologist David was the financial chairman of Greene County, Illinois. David is from Carrollton, Illinois and currently resides in Auburn, Nebraska. He has given several historical lectures as part of the Kregel Windmill Factory fall speaker series including “Patents and Inventions of Nebraska City” and “Windmill Factories During the World Wars”. Emily Folkerts began as Deputy Director of the Kregel Windmill Factory Museum in October 2018. In May 2018, she graduated with honors from Doane University where she majored in history and sociology and earned a minor in psychology. While at Doane, Emily was a member of Phi Alpha Theta honor society, Alpha Kappa Delta honor society, Psi Chi honor society, and Alpha Lambda Delta honor society. She was also the recipient of Doane University’s Kenneth R. Rossman Prize for being the top junior history major. Her history senior research was titled “Bruning, Nebraska: World War II in a Small Town” and focused on the experiences the people of Bruning, Nebraska had during World War II, interacting directly and indirectly with the war. Her worked earned her the honorable mention for the Colonel Robert R. McCormick Prize for military history at the 2018 Missouri Valley History Conference in Omaha, NE. Emily is very excited to work at the Kregel Windmill Factory Museum and looks forward to her future with the museum. The Kregel Windmill Company operated as a commercial enterprise in the same building in Nebraska City, Nebraska from 1903 to 1991. The firm had been established in Nebraska City on August 19, 1879 as a general manufacturer of goods for the agricultural trade. Soon it began producing windmills developed by George F. Kregel. The company continued to produce factory-made water pumping windmills until their manufacture ended due to the rationing of raw materials during World War II.From its earliest years, the Kregel firm had also engaged in the installation of windmills and water supply equipment and in windmill and well maintenance and repair. On the plains and prairies of North America, turbine-type wind machines combined with drilled wells allowed humans for the first time to live in semiarid areas which lacked reliable sources of surface water. George F. Kregel produced windmills during the period of settlement in Nebraska, and his products helped to make occupation of the land possible. The major product manufactured by the company for approximately 60 years illustrates how Americans have used and continue to use the renewable power of the wind to enhance the environmental quality of human life. During the 20th century, the water well maintenance and pump repairs business came to dominate the Kregel’s business. The company remained an active commercial entity in Nebraska City until the death of George Kregel’s son, Arthur in 1991. Even though they have not been mass produced since the early 1940s, Kregel Windmill Company “Eli” brand windmills are still found in service pumping life-giving water for both humans and livestock. They demonstrate clearly how wind power without polluting the environment can serve the needs of humans now and in the future to improve their lives. Source: Long-Range Interpretive Plan, Kregel Windmill Museum Company, by T. Lindsay Baker and John Bowditch, July 16, 1994. The less than 1,000 windmills produced at Kregel over a 112-year period were basically the same. 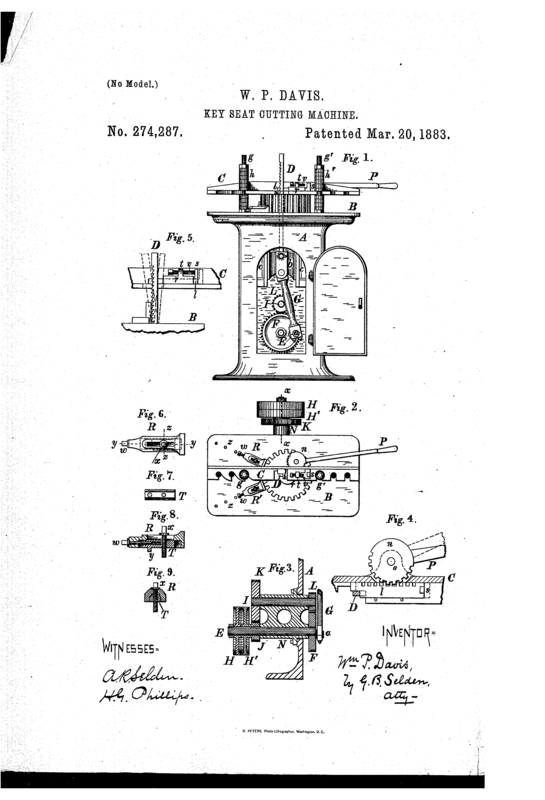 The customer could choose the size and the height of the wheel, but the rest of the machine was fairly standard. That is not to say that the Kregels didn’t change with the times. They also ran a retail store for water supply equipment, a well service business and an office to serve all three. After the windmill business declined, they moved to machine service and repair. Manufactured under the brand name “Eli,” the origin of the name “ELI” comes from the fact that George Kregel had a friend who was a preacher and he was named “ELI”. George named his windmills as an homage to his friend that passed away. “ELI” windmills were unique in their design. They were direct-stroke machines; one revolution of wheel produced one stroke of the pump. There were no gears in the Eli. Advertisements from the period tout the “ELI” windmill as being self-oiling with a ball bearing turn swivel. “Be sure you know the Eli, before you buy,” the ad warns. The galvanized angle steel towers came in 1-foot increments up to 60 feet tall. The windmills produced in this factory were pioneers in the use of renewable natural power of the wind. Fresh water for home consumption, livestock watering, and garden irrigation was produced without the use of fossil fuels. Innovation, resourcefulness, hard work and thrift have always been good business practices. For 112 years, the Kregels weathered good times and bad through application of those same philosophies. Equipment was modified and lines of goods were abandoned when customers’ needs changed. There was no distribution system or sales staff in the Kregel organization. They sold only to individuals. Therefore, most Eli windmills are found in the southeastern Nebraska area. A few have been located in western Nebraska and others in western Iowa and northeastern Kansas. During the 1940’s, when raw materials became scarce due to the involvement of the United States in World War II, the Kregels ceased the manufacture of windmills. They turned instead to water well maintenance and pump repairs. The Factory closed in 1991 following the passing of founder George Kregel’s son Arthur. In 1993, heirs of the Kregel estate donated the factory and its contents to the Kregel Windmill Museum. This 501(c)(3) nonprofit museum preserves the historic factory as a museum for the public; and is not government owned or operated. 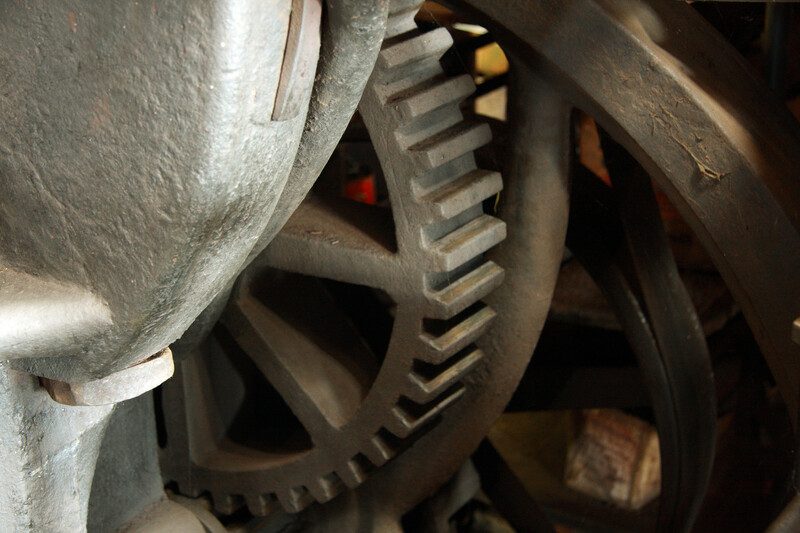 Come experience a step back in time in the world of machine manufacturing. The business office was the hub of activity for the factory operation where bills were paid, drawings were drafted and money changed hands. Workers in the pump repair area shaped the ends of wooden “sucker” rods and attached iron connectors to their ends. Power-driven machines used to finish the mechanical parts of the windmills were used in the machine shop and forge areas. The woodworking area was primarily used for cutting lumber for crates and for wooden service platforms mounted near the top of the steel towers. Galvanized sheet steel was cut and shaped for windmill blades in the sheet metal and assembly area. The Museum offers a glimpse of life in a small windmill factory that later operated as a repair shop until the doors closed in 1991. Modern conveniences did not exist in this factory. Air conditioning came from open doors or windows and heat from a small stove in the office of the uninsulated building. The galvanized angle steel towers of the Eli brand windmill came in 25, 31, 36 and 53-foot heights. The Kregels also manufactured beehives as a sideline product for many years. A chimney flue in the building is made from windmill tower steel, one example of the Kregels ability to adapt what was available to solve a particular problem. Windmills were manufactured at the Kregel shop for about 60 years. Windmills provide a clean source of power which pollutes neither air nor water. The wind has been used by humans throughout the world to make life easier and more productive. Eli brand windmills can still be found in service. George Kregel was far ahead of many of his competitors by using work stations on wheels. Kregel family members worked hard to make the business a success. George and then his son, Arthur, supervised the factory. George’s daughter Ella served as bookkeeper and secretary. Ella was at her desk in the office when she passed away.